SETTING: “Heart of the Ronin” is set in Japan in the late 1200's when the country is officially unified under the Minamoto Shogunate after the clan’s victory in the civil war against the Taira clan and the utter destruction of the Taira lines. But the Minamoto proved them selves weak and were usurped by a lesser line, the Hojo clan. On the continent, the great Mongol Empire established by Genghis is at its height of power under the able Kublai Khan of Marco Polo fame. And the Khan is not happy with Japan so he plans an invasion—with the assistance of the vanquished Taira line nobles. In this volatile mix we meet Ken'ishi, a young ronin samurai from mysterious parentage who was raised by a mythical creature of legend (Tengu, a Japanese ‘goblin), is able to talk with animals, and is armed with the famous Silver Crane sword. Just trying to make a living, Ken'ishi is challenged by an unscrupulous village constable who covets his sword. Ken'ishi easily kills him in a duel, but in the process makes powerful enemies out of the constable’s friends and followers who blacken his name and try to have him killed. Yatsuoki meanwhile, is a shadowy lesser noble, adviser to an important clan. But Yatsuoki is of the Taira clan and burns with the desire for power and vengeance. If Kublai is the path to that, Yatsuoki thinks nothing of betraying his country and his people. FORMAT/INFO: The electronic ARC of “Heart of the Ronin” stands at 440 pages divided into two Scrolls—Journey's End and A New Life—each of which is subdivided into chapters headed by a Japanese calligraphic symbol. Each chapter starts with a quote from some original Japanese or Chinese source adding to the novel’s exotic atmosphere. The narration is in the third person mostly present tense, but there are a few flashbacks to Ken'ishi's unusual upbringing. The three main POVs—Ken'ishi, Kazuko and Yatsuoki—get most of the face time with Ken'ishi's story arc being the most developed so far. “Heart of the Ronin” ends at a natural stopping point and I am looking forward to the next book in the series since I want to see more of Kazuko and Ken'ishi. 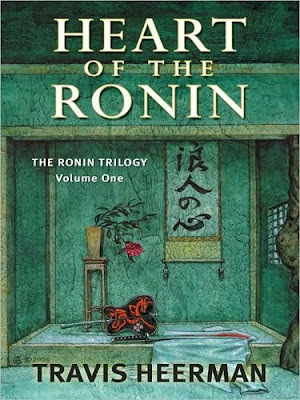 February 18, 2009 marks the Hardcover publication of “Heart of the Ronin” via Five Star Publishing. PLOT HINTS AND ANALYSIS: “Heart of the Ronin” starts with a bang when Ken'ishi, traveling with just his sword and a stray dog called Akao, is looking for food and work in an otherwise unremarkable village. There, he is marked as an easy kill by Nishimuta of the Takenaga clan, a villainous constable with an eye for the young ronin’s superb sword. In a duel, Ken’ishi kills the constable fairly, but becomes a marked man in the Takenaga domain and is forced to flee. While escaping, Ken’ishi encounters an overturned carriage and two ladies of clearly noble blood attacked by bandits. With the help of his companion Akao—with whom Ken'ishi can converse with as well as birds and other animals—our hero saves the day. In the process, Lady Kazuko takes a shine to Ken’ishi, thinking he would be the perfect protector for her father. In the other main thread of the story, Yatsuoki is constantly plotting to regain his “deserved” power as a scion of the once powerful Taira clan. Now a vassal of the Tsunetomo clan and instrumental in Kublai's invasion plans, Yatsuoki is dismayed at the death of the forest bandits who were among his cruder tools. But he sees in the young ronin an even deadlier weapon. I've always had a fascination with Japanese history and culture as well as fantasy, and this looks like it would be perfect. I really enjoyed the review as I though the details you put forth about the novel were excellent and I found myself intrigued as we don't see nearly enough Fantasy set in the Far East. Being a big fan of The Romance of Three Kingdoms era in Chinese History which dealt with a lot of mysticism I think this is a novel I'd find very enjoyable. This is why I like to check so many sites there's always a book out there that's exactly what you're looking for. Thank you for shedding some light on this novel for me. It's up to episode 17 for now and it's worth checking. Thanks for the info, I'm going to go check that out right now.